On Sept. 2, 2017, a fire started along the Eagle Creek trail in the Columbia River Gorge National Scenic Area. Fueled by vegetation that had not experienced rain in 83 days, the fire quickly took hold and spread to over 48,000 acres—jumping the Columbia River and scorching healthy forests in both Washington and Oregon. The fire inspired thousands of individuals to contact Friends inquiring about ways to give back to this special place. Soon after the fire, the U.S. Forest Service published the Burn Area Emergency Response report stating “invasive species are the most serious ecological threat, due to the fact that large burned areas open the watersheds to the rapid spread of species adapted to colonizing disturbed soils.” Recognizing this need, Friends formed a partnership with the U.S. Forest Service and Oregon State Parks to marshal the public’s energy to minimize the spread of invasive plants. Public Land Stewardship builds on previous experience in stewarding our land trust properties across the Gorge. Public Land Stewardship works to mitigate the spread of invasive plants by removing invasives and then planting natives in the newly created open areas. This two-part approach is critical because the Eagle Creek fire disturbed the soil and burned the tree canopy, allowing more sunlight to reach the forest floor and enabling invasive plants to grow and produce quicker than native plants. Also, invasive plants lack natural enemies therefore leading to a loss of habitat diversity. 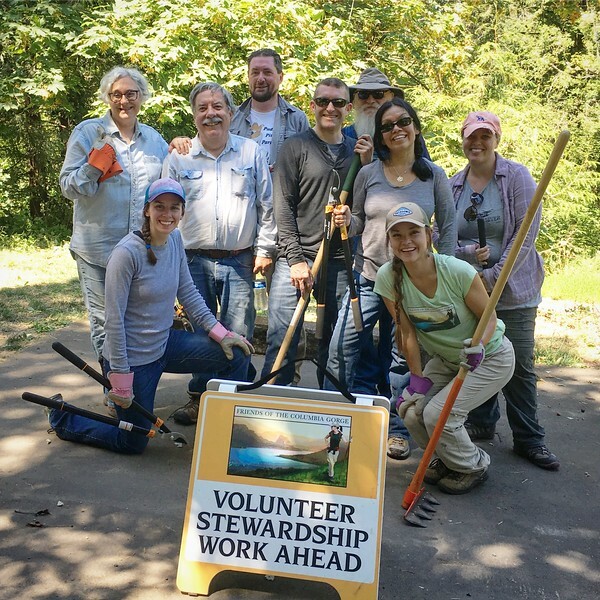 Stewardship work parties have occurred at some of the most heavily visited trails in the Gorge, including Eagle Creek, Multnomah Falls, and Angels Rest. Some of the most common invasive plants threatening the Gorge that we’ve been removing are English ivy, Himalayan blackberry, and herb Robert. Immediately following the fire, Friends and three other nonprofits—Trailkeepers of Oregon, Pacific Crest Trail Association, and Washington Trails Association—partnered together to form the Gorge Trails Recovery Team to leverage the high level of volunteer interest. Within the Team, Friends’ focus is on invasive plant mitigation work and the other organizations engage in trail restoration activities. Another Friends' focus area has been to increase the public’s awareness and information on the ecological threat that invasive plant species present in the Gorge. Since the fire, Friends has organized or participated in nearly a dozen events and led three invasive plant identification hikes. We have also stepped up to take a lead role at maintaining trailhead boot brushes in the Gorge and have been diligently distributing individual boot brushes at outreach events. Friends has also co-managed the Eagle Creek Fire Gorge Stewardship and Trails Resilience Facebook page with the U.S. Forest Service. Managing invasive plants in the Gorge will take many years. This is just the beginning of a long-term strategy with every handful of invasive plants pulled making a difference. In the fall and winter, planting native vegetation will occur and soon we will be launching a volunteer plant monitoring program at key locations in the Gorge. These reported findings will play an integral role in the planning and prioritization process of future stewardship work.